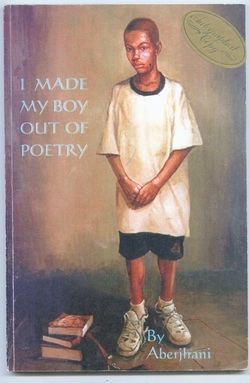 Cover of 1st edition of I MADE MY BOY OUT OF POETRY by Aberjhani, featuring classic art by celebrated New Orleans and New York artist Gustave Blache III. Prior to its publication, work from the title appeared in a number of both well-established and underground publications. These included: The African-American Literary Review; The Angry Fixx; The Dull Fly; The Georgia Guardian; Out of the Blue; Poets, Artists, and Madmen; The Savannah Literary Journal; and The Savannah Tribune. Later, ESSENCE Magazine featured work from the title. This little volume, Aberjhani's first, is brash, bold and daring. The structure is, for me, unusual as it offers a mixture of genres. There are several clusters of poems, each dealing with certain themes and images. These are interspersed with short stories which are strange and mystical, tending toward the bizarre and sometimes even displaying a sort of--how shall I put this?--black humour. The first poetry cluster deals with the body and with rivers, as well as the flow of language. The second cluster looks at the poet as a black man, rooted in a geographical location (Savannah, Georgia) and in the often turbulent history of his family. The third looks at the poet as connected to his nation, but also at his ties to both Europe and Africa. The fourth cluster seems dominated by light and the fifth looks at the poet as poet. This is not to suggest that themes and motifs are limited to one particular section. The whole book (not just the poetry) is imbued with a powerful spirituality. This is expressed through nature, through light, through the body and through human sexuality. The short stories seem to feature solitary people who are sometimes attached to one place (the narrator of "Company for Melissa") but more often wanderers (the protagonist of "Elijah's Skin"; Thorndeaux in "Shadows and Prayers and Light") . They have odd powers, and even when their intentions are good (which is not always the case), they can be dangerous. Though some are likeable and sympathetic, others are more abrasive in their dealings with those around them. Sometimes this effect is fully intended; other times it is not. Finally, Aberjhani is a writer who takes his inspiration from various religions, cultures and writers. For example, one can sense the influence of American poets such as Walt Whitman and Langston Hughes. There is Christian imagery, but also a taste of Persian and Arab culture. And there are probably more influences which I haven't detected. Aberjhani's vivid style makes a powerful impression. But more importantly, he writes as one who is aware of where he comes from and of his function as a writer. Local author I worked with for awhile at Media Play, a division of Musicland Corporation, which sadly went out of business. They used to own all the Suncoast video stores in malls across America, and all the Sam Goody music stores in malls across America... you remember the good old days when we had plenty of retail stores in malls, and retail workers in America. I blame Jeff Bezos, Target & Walmart Corp. Terrible what they're doing. Don't be surprised when all the Walmarts start disappearing. Autographed review copy kindly provided by author and GR friend, Aberjhani. This is not to suggest that themes and motifs are limited to one particular section. The whole book (not just the poetry) is imbued with a powerful spirituality. This is expressed through nature, through light, through the body and through human sexuality. The short stories seem to feature solitary people who are sometimes attached to one place (the narrator of "Company for Melissa") but more often wanderers (the protagonist of "Elijah's Skin"; Thorndeaux in "Shadows and Prayers and Light") . They have odd powers, and even when their intentions are good (which is not always the case), they can be dangerous. Though some are likeable and sympathetic, others are more abrasive in their dealings with those around them. Sometimes this effect is fully intended; other times it is not.